a new pattern every week, from Gon Homburg. Free patterns for beginners, tallies and tape laces, spiders, etc. http://kruzhevosasovo.narod.ru/training/00.htm The author put her entire book online. Each page has a translate button. Traditional Russian bobbin lace. 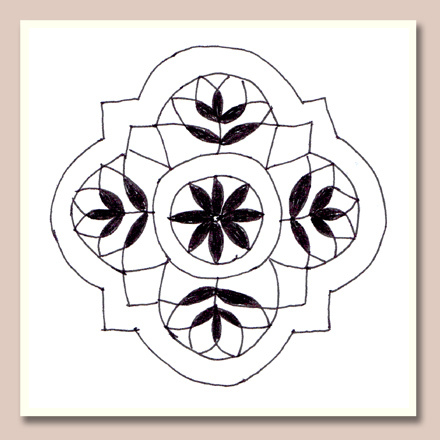 Links on this page to 3 entire books of patterns available as a free download. Patterns are Cluny type, torchon, and continental guipures. http://artesaniadegalicia.xunta.es/publicaciones/encaixes hundreds of patterns. Beware: of the 3, the smallest pdf is 46 mb, the largest 96 mb. Maribel Albert says this about Raizame "
Raizame do encaixe Galego: This sampler seeks to recover, unite and make available to all lacemakers forgotten techniques and models, with so as not to lose, since many of them "die" with the few old ladies who still remember how to work them. This loss would be irreparable because all the drawings and the less contaminated techniques are the characteristics that make the Galician lace and giving it an identity. Author: Conception Canoura Leira, Publisher: Xunta de Galicia"
The 2 Tebbs books below are part lace patterns. A few are for beginners. Most are more complex. Both are on the ariz.edu site listed above under T.
In #1 look for Dillmont Dillmont, Thérèse de. Les Dentelles aux Fuseaux IIme Serie [Bobbin Laces, Second Series ] This is the part about bobbin tape lace. A brief summary of contents of the 8 parts follows. part 5: starts with pattern 47 This one is important. I adapted it & worked sample. Dillmont Les Dentelles aux Fuseaux 1re Serie [Bobbin Laces, First Series ]. In 4 parts. Torchon bobbin lace. Parts 1 & 2 are photos of the basics, and the French text. Part 1 is grounds and basics, Part 2 starts with wave and fan motifs. Part 3 is torchon prickings, part 4 is torchon patterns. Many of these are very simple and suitable for a beginner. Woodward, Mary Eva A Text Book on Cluny and Torchon Laces 1901, Gordon Mackay and Company Limited, 102 pages. Note:downloaded from archive.org Posted March 1, 2012. SAMPLE PAGE. File size 4.8 MB PDF Has Cluny and torchon patterns. A needlelacetalk member found some booklets and magazines scanned and posted on picasa. So have valid copyrights and should not have been posted. But some of the booklets are old enough that their copyrights are expired. Here are links to those albums. https://picasaweb.google.com/ladalace6/InternationalSchoolOfArtisticClunyLaces actually tape lace, not Cluny, no patterns, but you could work directly on the photo. http://www.carolgallego.com/neckline1.html Hinojosa pattern for neckline lace. http://lynxlace.com/collarF19.html Bobbin lace floral collar pattern by Lorelei Halley, for Honiton or Duchesse technique, enlarged scale. No photo, just the pattern. 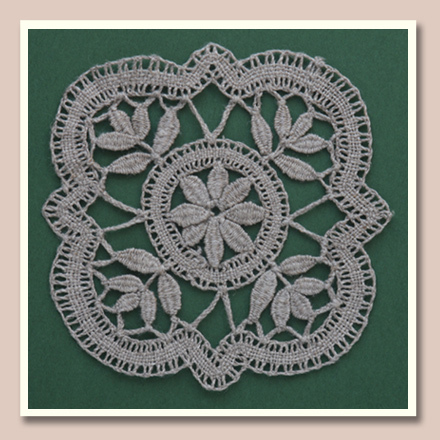 When we acquire patterns for other kinds of lace, we will list their albums here also. Some free patterns, with instructions. I tried them again, and they all do work. Perhaps I was trying at a very busy time for the internet in my area. That may have slowed down the transmission time. Perhaps I was just too impatient. I checked the three links and works perfectly. The second link is for embroidered tulle the others links is for bobbin lace. The first link doesn't download properly. It just stops halfway through. The 2nd one is good. I think it could be used for needlelace, or for embroidered tulle. Which was it intended for? The 3rd link just says that the site is under construction. I suppose we should look again in a week to see if there is progress. A person who calls herself Gibritte has a website/blog with a lot of free patterns, which I think are her own designs. She also has a picasa account, where I have seen photos of her work. Joy -- Regarding scarf patterns. I saw this today on facebook. It occurred to me that a rectangular mat pattern could be worked longer than usual and made into a scarf. Here is an example. Why not just come up with a wide insertion by removing the edgings and matching up the pattern to make it as wide as you want it? It would allow for a more uniform look unless you want the sewing as part of the design. The patterns in the Beginner's Guide to Bobbin Lace do not have edgings like an insertion from what I could tell, they look more like the edgings on the beginning bookmarks. They appear to be about 4-9 inches wide with no actual length listed. The patterns are marked for a pin distance of about 1 cm in the ground for what they are calling a double knitting yarn if this helps any. How about making up your own by taking several torchon insertion patterns and working strips, then sewing the strips together. You would only need to be sure all the patterns were printed out for the same size thread. Beginner's Guide to Bobbin Lace by Gilian Dye & Adrienne Thunder has a couple of scarf patterns in it. I believe they are Torchon but am still too new at this to differentiate the different types of lace. Roughly a dozen patterns, most relatively simple. A design-it-yourself torchon mat template.